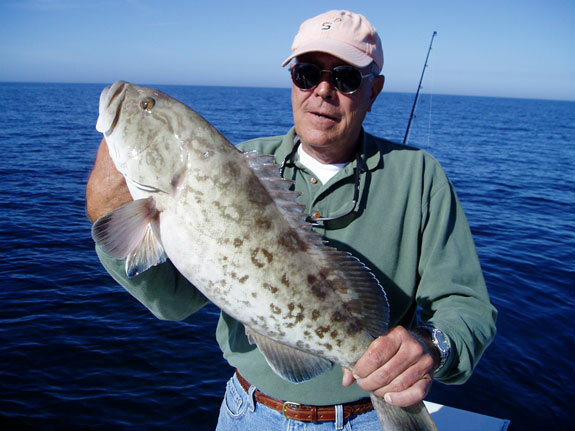 Grouper are a highly sought after fish off Anna Maria Island due to their food value. Excellent white firm flesh make them a favorite dish. Their are many species of Grouper but the to main ones in gulf off Anna Maria are Gag and Red Grouper. Gags are light brown or gray with wavy markings and the edges of their fins have a bluish hue. They can reach 50 pounds on offshore wrecks and recorded as high as 80 pounds. Most of the catches are in the 4- 12 pound range and are in depths of 30 -100 feet of water. They are an aggressive striker and fight hard all the way to the surface. Capt. Tom Chaya uses stout rods with 50-80 pound "powerpro" line to pull them off the bottom. Trolling with big plugs over hard bottom in the passes and reefs also can provide big strikes from the aggresive grouper. Red Grouper are red with brown tones on their lower portions. Their food value is as good as the gags. Capt. Tom Chaya uses the same methods on bottom fishing as with other grouper but also uses a myriad of other baits. Crabs, shrimp, squid, and other cutbaits placed on the bottom will ensure good hookups.